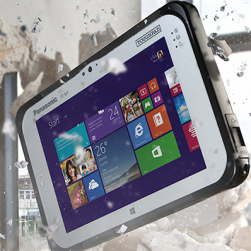 Panasonic launches a Value version of its 7 "Toughpad FZ-M1. Lightweight and durable tablet without a fan, which works with Windows 8.1 This tablet can be great replacement of aging PDA equipments in sectors such as transportation, logistics, warehousing, hospitality and security services. Toughpad FZ-M1 uses a dual-core processor Intel ® Celeron ® N2807 for its performance, combined with efficient power consumption and minimal heat generation. Due to its high flexibility it can be configured for the specific needs of the users. The display provides an unmatched level of display quality when you are working in confined spaces and in the field. The battery allows operation of up to 8 hours and is hot swappable. Battery is fully charged in 2.5 hours. FZ-M1 includes optional Gobi 5000 module for 4G/LTE backward compatibility, as well as modules for Bluetooth ® v4.0 and wireless networks. There is a front 2 megapixel camera with a stereo microphone and a 5 megapixel rear camera or 8MPx. With tablet you can also purchase a desktop cradle, docking in-car charger for multiple batteries, passive pen and other accessories. Value version will be supplied from June 2014. In case of any questions feel free to contact our EPRIN TEAM specialists.